We spent the morning investigating the Basilica of the Annunciation in Nazareth. Outside the church are arcades with representations of the Virgin Mary presented by many countries of the world (including Wales). The building is striking, with a tower resembling a lighthouse, and there are more representations of Mary inside as well as other art works on the walls. We saw an interesting poster on our way up to the church. 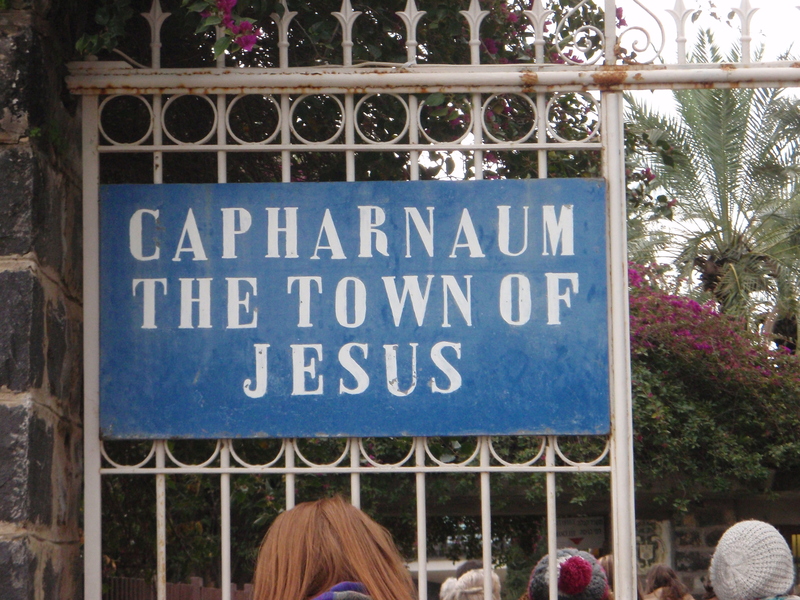 After that we travelled to Magdala, on the shore of the Sea of Galilee, and took a boat trip up to Capernaum. The weather had been very wet and we weren’t sure whether the boat trip would go ahead, but the sun came out and we had a lovely journey along the coast, with the snow-covered Golan Heights in the distance. The boatmen stopped the engine when we were out on the water so that we could enjoy the sound of the waves lapping the sides of the boat and think our own thoughts; however, this intended moment of tranquillity was somewhat marred by the sound of Israeli jets screaming overhead, keeping an eye on events across the border in Syria. Capernaum was the place where Peter lived and where Jesus spent a lot of time; there is an impressive statue of Peter near the remains of what is believed to have been his house. After visiting Capernaum we adjourned to a nearby restaurant to lunch on St. Peter’s Fish. Glad you enjoyed the fish! Thanks – I remember the fish – with a very fresh salad followed by fabulous dates-. one of the nicest meals I have ever had.